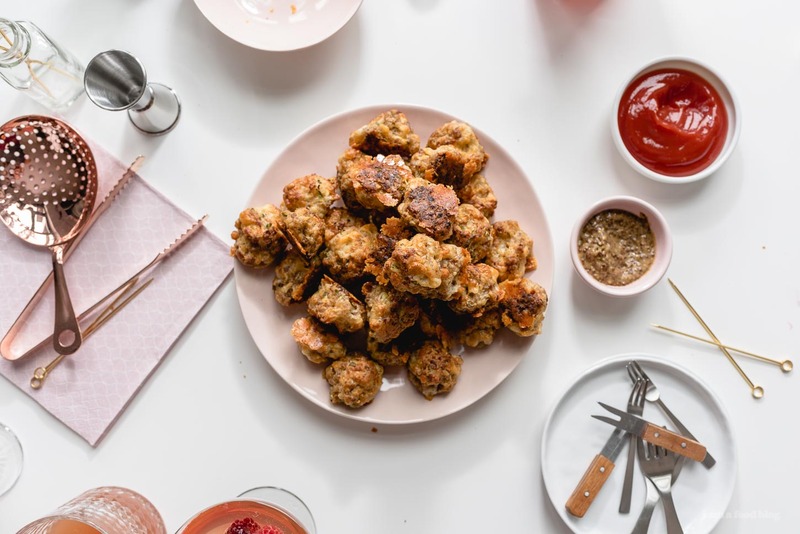 These crispy on the outside, tender on the inside sausage cheese balls are absolutely addictive. Perfect for holiday party season! If you have a holiday party and I’m invited (I hope I’m invited! ), I’ll be hanging out at the appetizers, just eating away, awkwardly avoiding conversation unless it’s about said appetizers. I swear I could live on appetizers (or mini food items) because I love variety. But then again, if I really like something, I can eat a lot of it and mini makes it more fun. 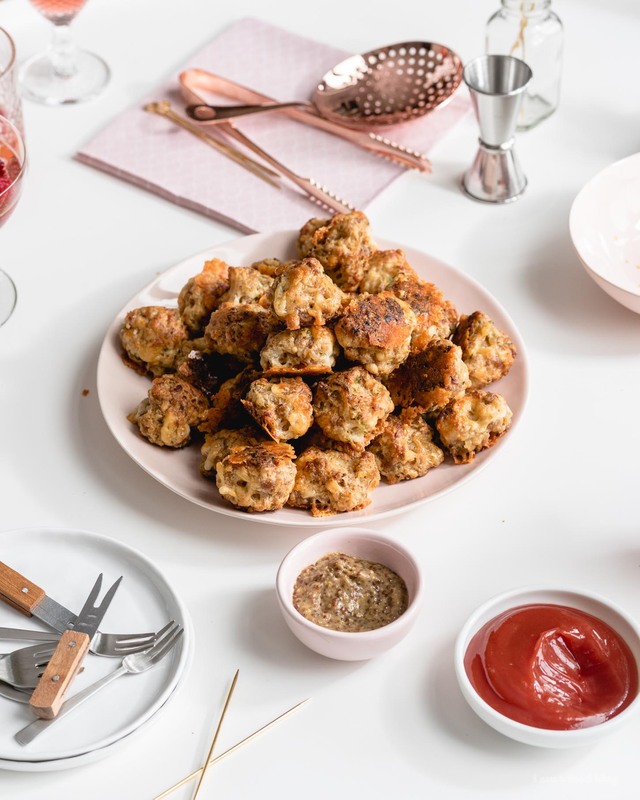 Fun like these sausage cheese balls. 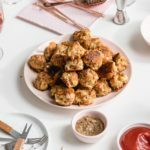 Have you guys had sausage cheese balls? Apparently they’re a classic American appetizer around Christmas time. For some reason we never had them growing up – our appetizers were more the deep fried shrimp or dumplings, you know, classic Asian appetizer things. I feel like I kind of missed out so I’m making up for it now by making all the old school classics. Mike and I discovered these sausage and cheese balls while on a little youtube binge. We love watching Chef John – do you know him? He’s the one who taught me how to make inside out grilled cheese and I dig him because he does old school recipes in a very easy to follow way. 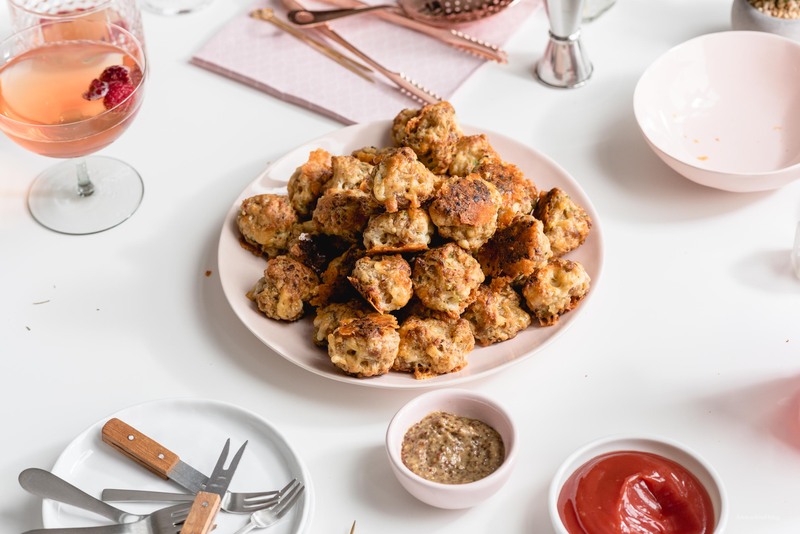 As he explains, sausage cheese balls are just sausage, cheese, and a biscuit type dough all mixed up together and then baked for extreme crispiness on the outside and a soft yet firm texture on the inside. It’s kind of like you have a breakfast sandwich in one portable ball bite. Anyway, these sausage and cheese balls stood out, saying make me! I’m not one to ignore the siren song of sausage, so I made them and they were delicious. We snacked on them while they were warm, we snacked on them while they were room temperature, we snacked on them right out of the fridge. It kind of got to the point where we left the house because we didn’t want to be responsible for eating over a pound of sausage in a couple of hours. It turned out to be a good move because that way, we had leftovers. The next day, I made Mike a little breakfast in bed situation with some sausage balls and sunny side up quail eggs. It was super easy because all I did was heat the balls up in the microwave while I was frying up the eggs. I love make ahead recipes, don’t you? Alright, I’m off to blast some holiday music. I need to do some appetizer research too…are there any appetizers you guys love that I should be making? Let me know in the comments! Heat the oven to 450°F. Line a large baking sheet with foil and lightly oil. In a large bowl, whisk together the flour, baking powder, and salt. 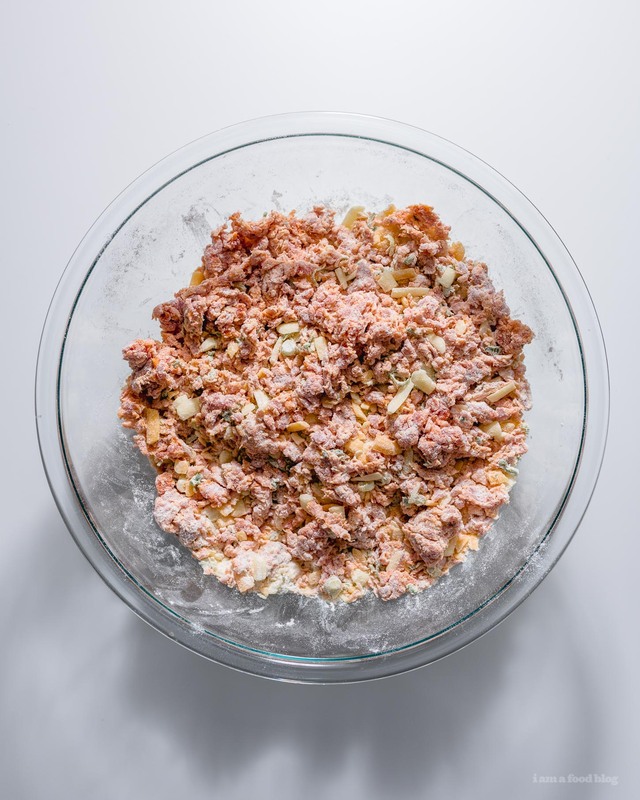 Stir in the cheese, then mix in the sausage, green onions, and nutmeg, with your hands, until it comes together like a dough. Add the two tablespoons of milk in, mixing until just combined and you can form balls of sausage with your hands. 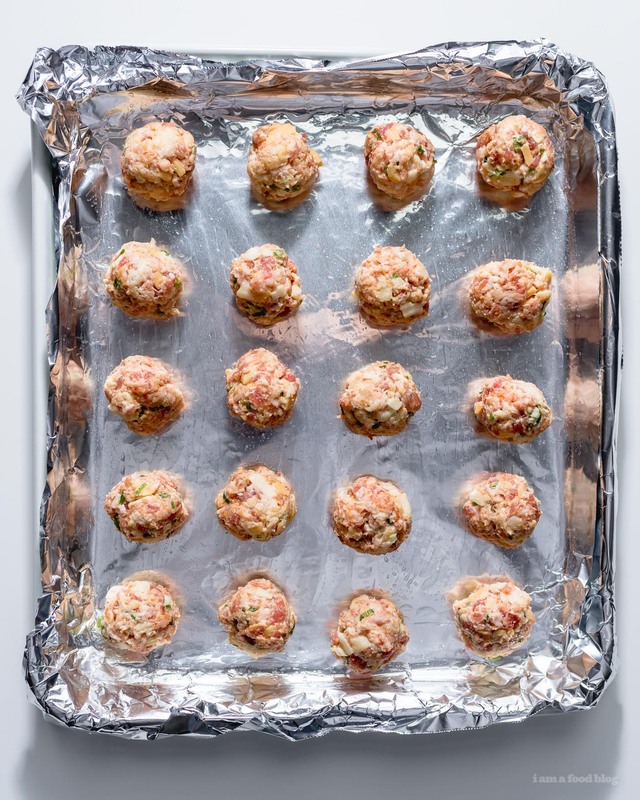 Using a cookie scoop (it helps to have a small bowl of water to dip your scoop in), scoop mixture into 1 inch balls, placing on your prepared baking sheet. Bake at 450°F for 12 to 15 minutes, or until cooked through. Turn the broiler on for 1-2 minutes for a bit of extra color. Let rest of 5 minutes (they need to cool slightly before they will release from the foil), then enjoy hot or at room temperature! Do ahead: you can make the mix, form the balls, and place in the fridge until you want to bake your balls off. ooh the BEST kind of dinner! In the instructions, it says to add the flour, but flour is not listed in the recipe. How much flour? These look great! I also didn’t grow up with them and look forward to trying them. How much flour do you use? whoops! it was there, i just edited it wrong. everything’s good now. thanks for the heads up! Yeah, I’m with Natalie! I love small bites for dinner. I will give them the test run over the weekend before committing to bring to my work potluck. I always agonize over the potluck sign up sheet. I can never make up my mind what to bring as there’s too many options! Sweet or savory, hot or cold, small bites or one big pan? Thanks for helping solve the dilemma this year! One note: it looks like the flour is missing from the ingredients list? thanks for the note on the flour, updated! yaaaaas to all the appetizers! Mmmmmm…I did grow up with these. My mom made them for cocktail parties. I’m a good bit older than you though! Her recipe used Bisquick…love that yours does not! Will definitely make these this holiday season! My family ALWAYS has sausage balls for Christmas. We don’t use green onion, just Bisquick, Jimmy Dean sausage, and cheddar. Then we dip the balls in strawberry jelly. I know it sounds weird, but it’s seriously the perfect combo of savory and slightly sweet. Yum!! These sound great for a holiday party I’m invited to, however the host is gluten-sensitive. Any suggestion to make these gluten-free, i.e. what’s an appropriate substitute for wheat flour? i haven’t tried with gluten free flour, but that may work? i’m not sure if they’ll be tough or not though. Any suggestions on a sauce? to be honest, i had them with ketchup because i’m a child like that, but it think sour cream/creme fraiche with some chopped herbs mixed in might be nice or if you want to be crazy, a warm cheese sauce! Hi Steph! Longtime fan of your site here, but first time coming out of the woods to comment :) these look great as a quick breakfast/snack to grab and go. Do you think they could be baked ahead and frozen? Thanks! the inside is not mushy at all, did it cook all the way through? it your oven runs hot, it probably cooked the outside before throughly cooking the inside – you can probably cook them for a bit longer at a lower oven temp if you still have them hanging around? or you could microwave them for a minute, to make them hot again/cook them through. but, having said that, the insides are not as firm as, say a meatball because of the “biscuit” part of the recipe, so they are sightly more tender.